I am not a very fruit person! I know that’s terrible, but fruits is the only thing I am choosy about. However Mangoes top the list of fruits that I do eat! So, every year I wait for summers, as that is the time for mangoes and some nostalgia! I come from a belt where mangoes are loved and grown. Though my grandparents weren’t farmers, we had a big garden in the backyard and there were loads of mangoes trees there. Every year visiting grandparents in summer vacation meant playing crazy games with my cousins and making the garden our home! We climbed trees, tried plucking fruits, built tents with bedsheets and even had garden picnics! The fun never ended and our best friends were mangoes! Our ancestral home is nearly 100 years old! It has a typical architecture of the yore with long corridors and huge halls. One such room was the designated place to store summer fruits. When the time was right, the gardener would pluck the fruits and bring them to the room. There would be rows and rows of mangoes and Jackfruits. Once the harvest was done, granny would sort them into various kinds – The over riped, Just right and yet to ripe categories. They would also be sorted based on their variety. So wherever you see you would see mangoes and jackfruits! I felt like Alice in Mangoes land in summers. Mangoes were our snacks. We were asked to pick any and as many as we want from the over ripe category 😛 After all the just right ones were to be used for cooking and for lunch and dinner times. So basically, summers were a mango diet for us. The long hours that we played Hide and Seek or Police and Thief mostly meant filling our pockets with mangoes and eating them in our hideout. The game ended when our stash of mangoes were over and stomach’s filled. The house doors were always open so we would just zoom in, grab a few fruits and get out of another door – another characteristic of old style homes! There are lots of doors and connected passages. Another fond memory that is associated with Mangoes is my aunt’s visit. Every year when she visited with her children, her car would be filled with gifts for everyone and mangoes for children. She would bring a crate full of best of Ratnagiri and Devgadh Alphonso mangoes. Today, the aunt is not among us, but not a single summer goes by without her memory. Her smiling face and booming voice filled the house with happiness and joy. She brought with her countless stories that we enjoyed as we sucked at mangoes after dinner. 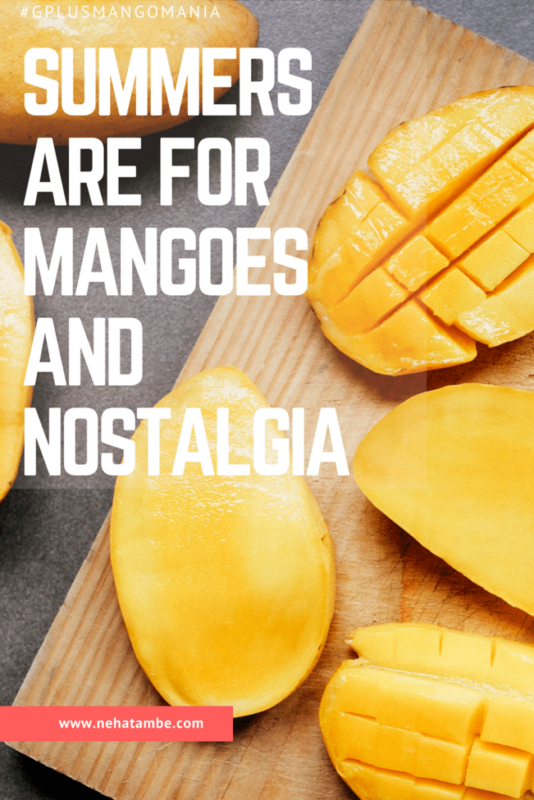 Mangoes are not just a fruit for me, but a treasure trove of memories. Me and my gang of cousins talked, played and even exchanged growing up wisdom in summer. We had aamras eating competitions during lunch, having one day as mango meal where everything was made of mangoes and we had mango eating competition during dinners. And trust me, when you have a house full of kids, you need one resource only to cut the fruit! The summer highlights were the big meet up at granny’s place and mangoes. The best of memories that shaped my childhood and taught me some valuable lessons happened over a plate full of mangoes. Nostalgia indeed both my grandparents side had countless mango trees in their backyard and summer vacation meant judging whose mangoes were more sweet. I remember my dadi would say they can beat us with mangoes but not with our chickoos…I miss those days and my grandparents so much. Haha! Being hit by mangoes seems fun! I have never really been able to get into mangos. But summertime, that I can get into! I loved hearing your stories about the mangos and memories from your grandparents though. For me it is grapefruits because we had a grapefruit tree in our backyard that produced an abundance and my nana loved picking them and eating them when she came over. Ah! That’s lovely, it is so much fun plucking fruits from our tree. Ah mangoes! We have the sweetest mangoes in the Philippines and I also love our green mangoes. Green mangoes are more nostalgic for me since we don’t have that here in the US. Whenever I get to eat a green mango that tastes a little bit like ours back home, it makes me reminisce of the old days. Oh! You must have tons of stories too! I love mangoes! This is the first time that our tree will be a mango producing tree and I can’t wait! Good story. Yum I love mangos!! Last year, I send a thank you gift to a friend from Hale Farms and it was a big basket of ripe mangoes! They are SO good. Thankyou note with fruits is a great idea! Mangos are at the top of my list as well!! They taste good frozen too!!! The way you feel about mangoes is the way I feel about raspberries! My grandparents grew tons of raspberries and I have so many memories of picking those berries with my cousins. Absolutely! Summers and Mangoes are two things which take me back to my childhood, I remember watching summer special kids programmes on TV, while devouring on those delectable juicy mangoes. Ahh Nostalgia! Lovely write up. Can’t agree more. Manged are nostalgia for everyone. 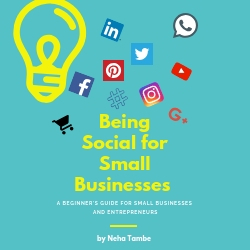 Thanks for sharing this happy post. The king of all fruits, I literally wait for the summer days and the reason is Mango. Mangoes surely bring back a lot of good memories of childhood days. Your post took me back to good old days. This is such a sweet and nostalgic post. Your ancestral home must be a fun place to be in. Mangoes surely delight up summer holidays. One of my favorite fruits us Guava that I miss in the USA. Talking about childhood fun then yes those were the carefree days Neha. This article is so heart touching . Reminds me of my gramdmothers place . We used to climb mangoe trees to get those sweet and sour amiyas at my nanis home. It’s called the king of fruits in our family. We just adore it and love the Mango season. Your article was quite relatable to our family too.